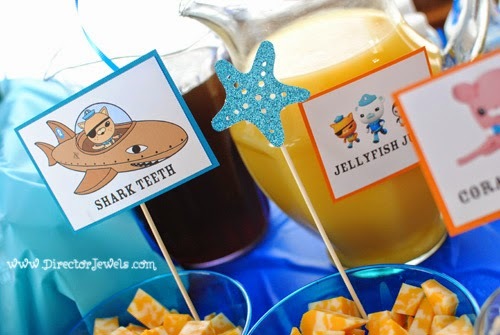 Looking for more Octonauts party ideas? 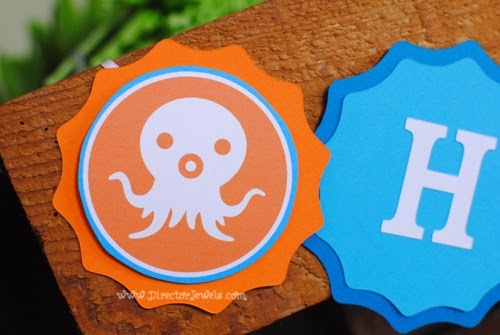 Make sure you check out our Octonauts Favor Ideas, Octonauts Food Signs Free Printable, Octonauts Birthday Party Decoration Ideas, Sea Anemone Pipe Cleaner Craft and Paper Plate Fish Aquarium Craft! 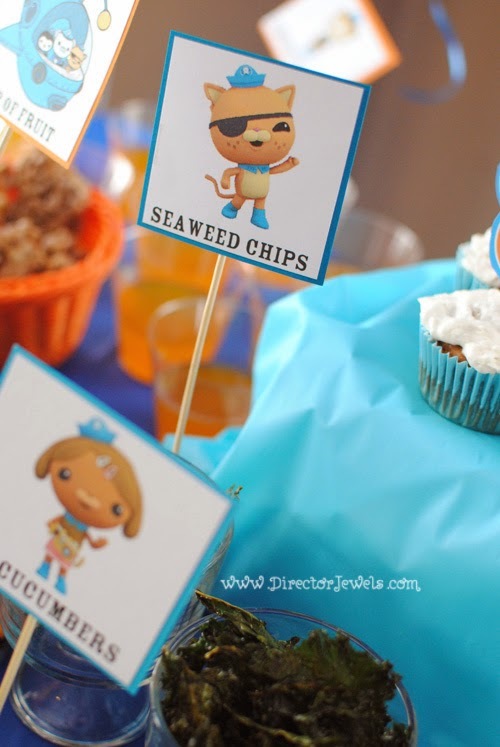 When I was planning Lincoln's Octonauts birthday party, I ran into some challenges when it came to Octonauts birthday party food ideas. Lincoln is on a special diet due to some recently discovered food sensitivities, so he can't have dairy, gluten, wheat, oats, or eggs. 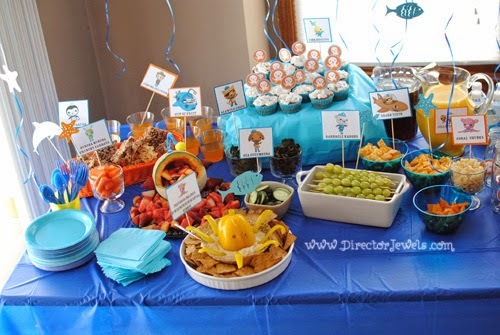 Making a birthday party food plan with those specifications felt impossible, but really, it turned out just fine. 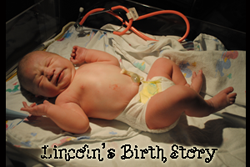 Lincoln loved just about everything, and if our guests thought the cake tasted weird, they didn't say anything. 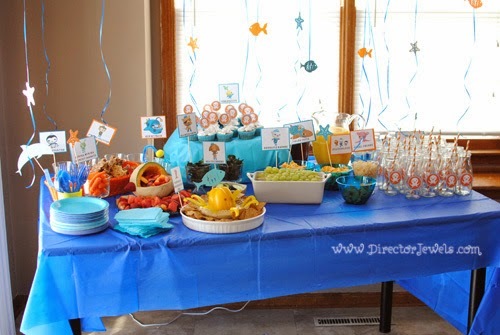 For the party table, I just did a blue tablecloth, representative of the ocean. 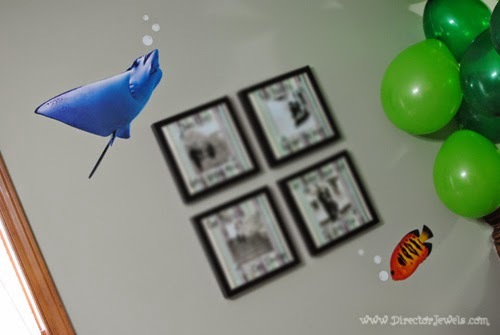 We attached small sparkly fish and sea creatures (cut with my Silhouette Portrait) to balloon strings and let those dangle above and behind the table. It gave a good impression of an underwater world. We found pictures of the characters online to use for the food signs. 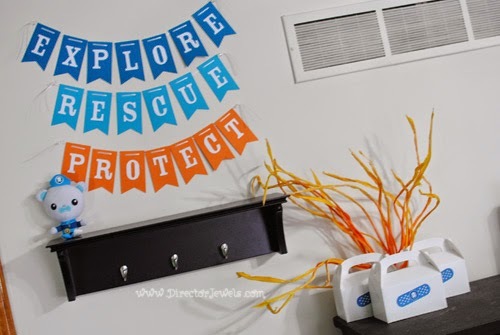 You can find my free printable of these signs here. -Peso's Sticky Starfish (similar to Rice Krispies treats, but made with vegan rice cereal, shortening, and gluten-free marshmallows, cut into star shapes). We also served sweet tea, but it was added at the last minute and didn't get a clever tag. Ha! 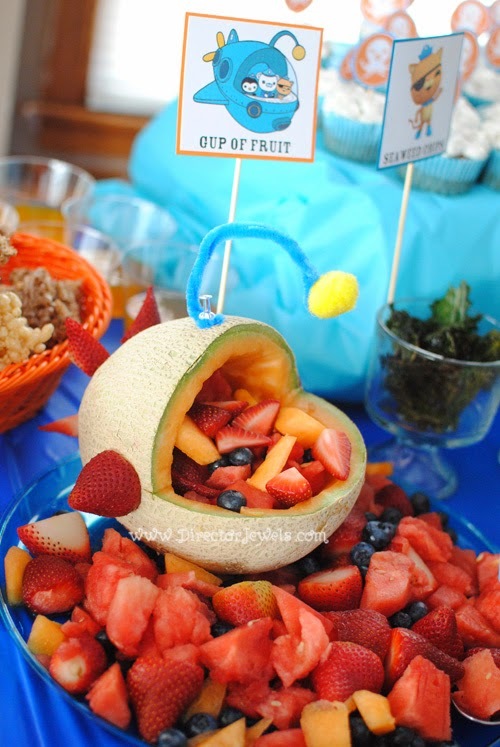 It really turned out cute - and everything was healthy! Definitely a win. 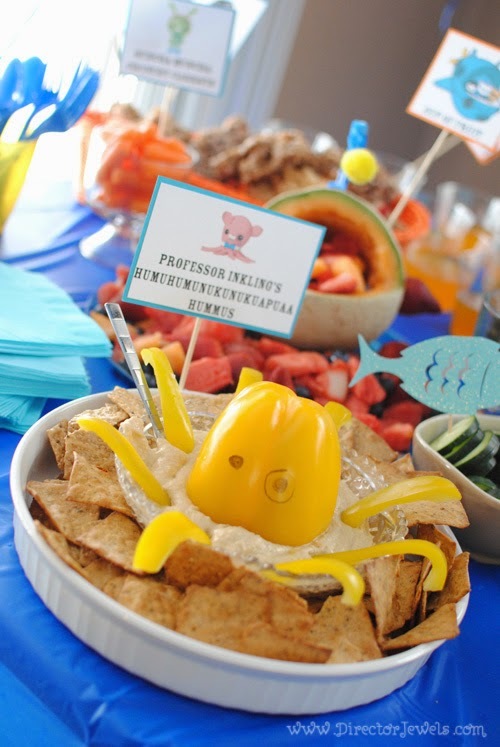 The Humuhumunukunukuapua'a Hummus included a bell pepper cut to resemble an octopus. Andrew drew on eyes and a monocle with a Sharpie. I wish bell peppers came in pink! 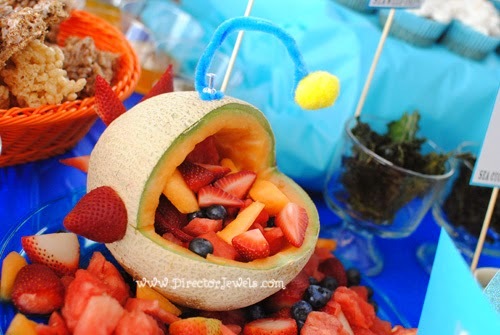 My kids were probably responsible for clearing out the strawberries, watermelon, canteloupe, and blueberries used in this fruit assortment all on their own. 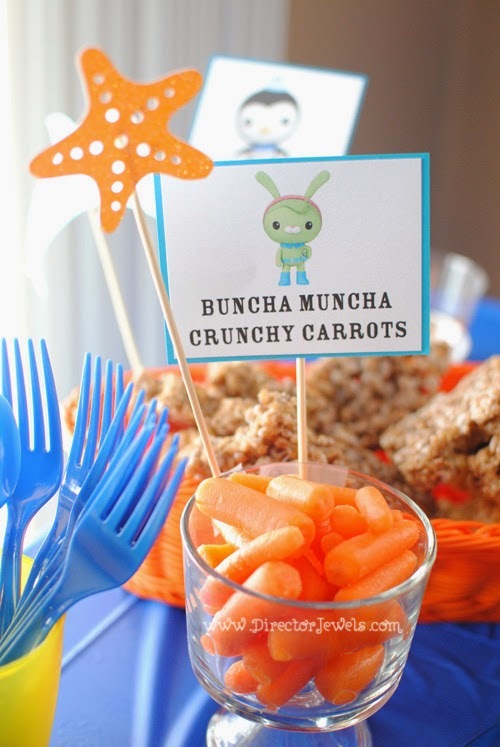 The Buncha Muncha Crunchy Carrots were definitely the easiest thing to make. The Sticky Starfish did not retain their sticky awesomeness very well. Within about an hour, they were pretty crunchy and hard to eat. I may need to create a better recipe. 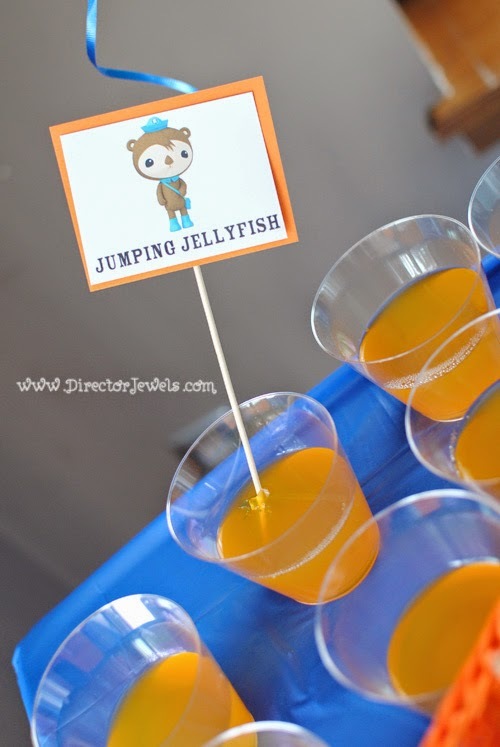 The kids loved the jello, too. It wasn't Jello brand - I found it in the health food section at my grocery store. It's not free of sugar, but it does not have artificial color. I'm surprised how much we loved these cupcakes (link above). They're vegan. It's the best no-egg baked goods recipe I've discovered yet. For the frosting, we made easy coconut whipped cream. Sea Cucumbers were really easy, too - just slice 'em up! Seaweed chips were made using a kale chips recipe we found on Google or Pinterest. I honestly don't remember which one, but most of them are pretty similar. They turned out great. They were actually one of my favorite things on the table. There was actually some real cheese offered in the Shark Teeth option, but my kids just ate the vegan option. I didn't think I should force our guests to put aside all normal things in one shot. 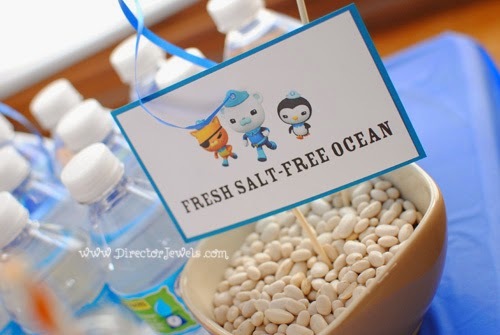 I didn't have a way to prop up the Fresh Salt-Free Ocean sign, so I used a little bowl of beans. But then I think everyone thought they were supposed to eat the beans. So it was a bit confusing. I had every intention of cutting up some Larabars (my kids' favorite snack lately) to be "Kelp Cakes," but ran out of time. Addie, ever the food thief, was happy to sneak in a rice chip before the party officially started. 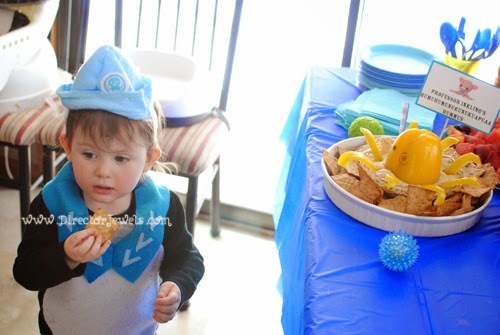 Lincoln was perfectly thrilled with his birthday cupcake, the food assortment, and all the other party activities! 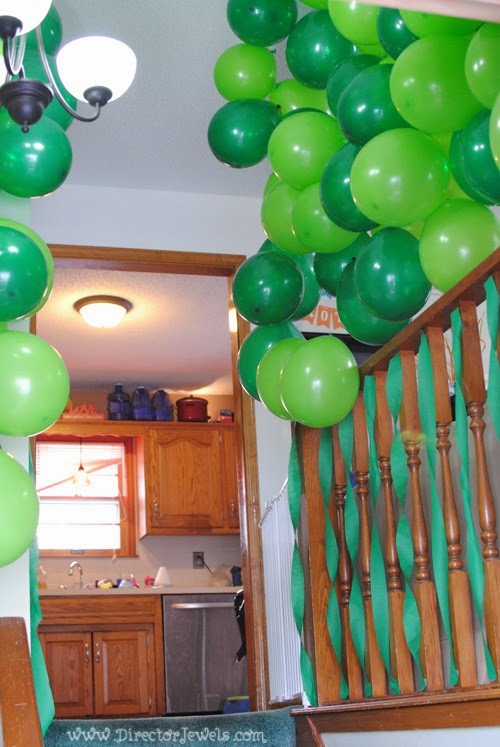 And that, friends, is why I plan parties - the sheer joy on my kid's face. 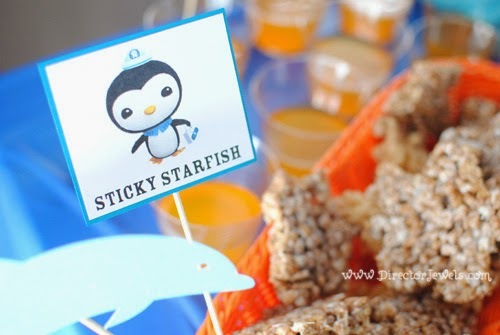 I hope you enjoyed these Octonauts birthday party food ideas! 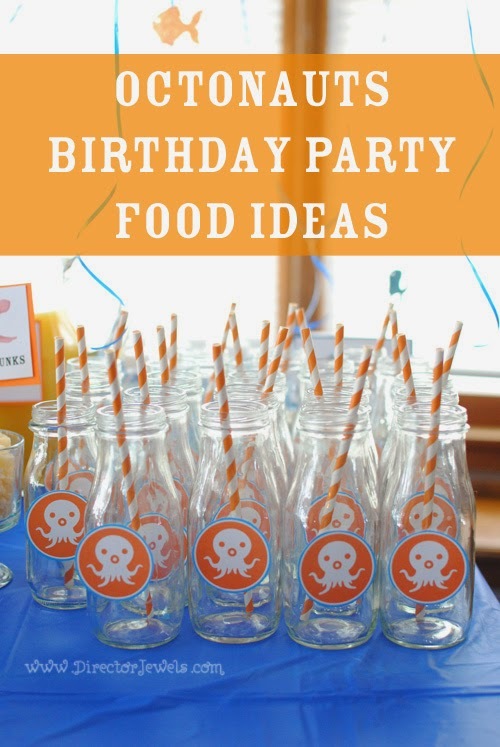 Let me know in a comment below if you use them for your own party! 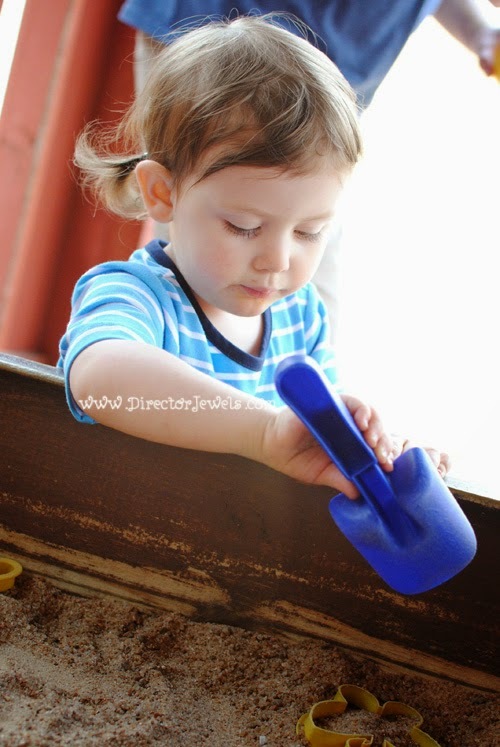 Digging for "buried treasure" at Silver Dollar City. Summer is on the way and we can't wait. This wagon would be the perfect spring or summer accessory for anyone with little ones! Who in your family would love to go for a ride in one of these? 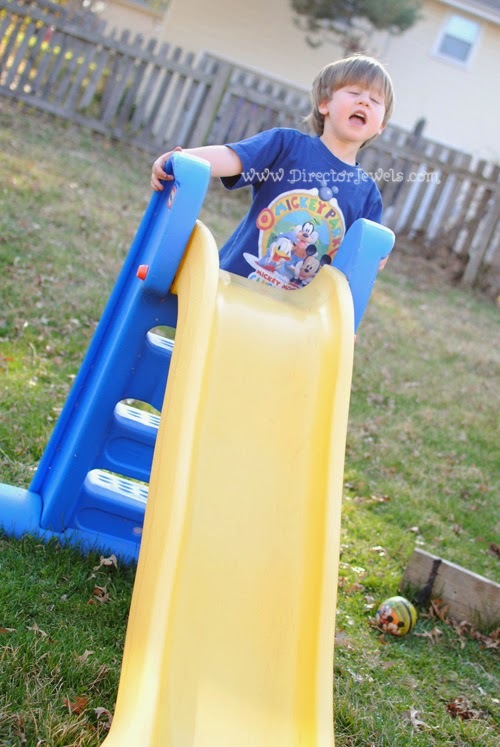 hosted by Thrifty Nifty Mommy and Viva Veltoro and sponsored by Step2! 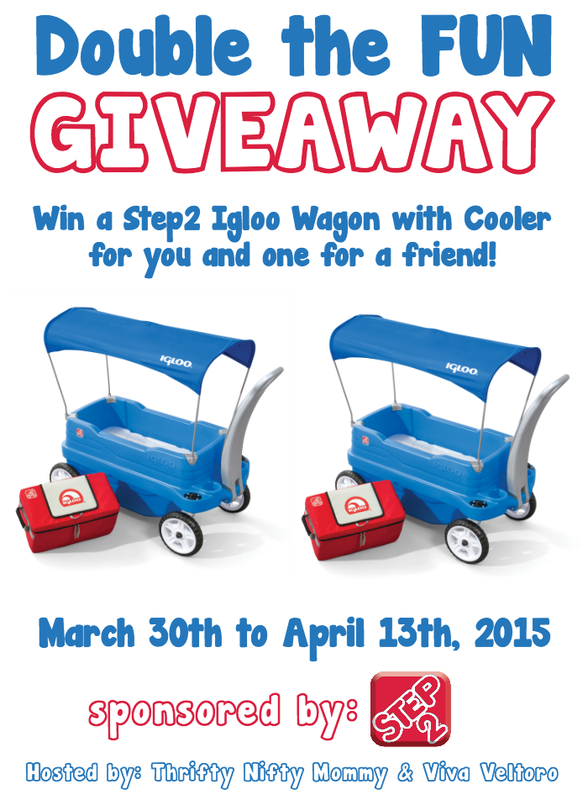 The Igloo® Wagon with Cooler by Step2 is the perfect ride-on for long days trips for the little ones. It’s a 2-in-1 wagon and cooler that will keep your kiddos comfortable and your food nice and cool. This durable blue wagon provides youngsters with an enjoyable ride around the neighborhood, campground, zoo or amusement park. Your family can have a picnic in the park with all the snacks and refreshments the Igloo® Wagon with Cooler can hold! Made in USA of US and imported parts from China. Disclosure: I received a free activity kit to review. All opinions expressed are my own. Sometimes, even the best-laid plans go astray. You know that we started preschool back in September. We were so excited about it. We had a great couple of weeks. And then...it just didn't happen for a day or two. Then a few more days. Then a week. You get the idea. 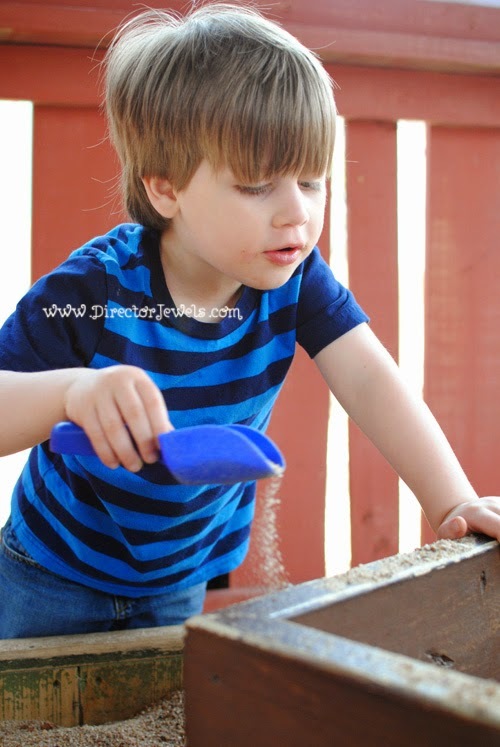 Official, structured preschool is something we're going to strive for again this fall. He's still only four. We've got plenty of time. And the honest truth is, he learns so much just by being a kid and playing, running, shouting, jumping, and asking questions that I'm not worried about his knowledge level. As a kid, I was a voracious reader. I was never without a book. I would sit for literally an entire day just reading and be perfectly content. It's pretty clear that that is not my son's learning style. He needs to be active. He needs to be on the go. He's going to need motivation to sit down and do math problems. 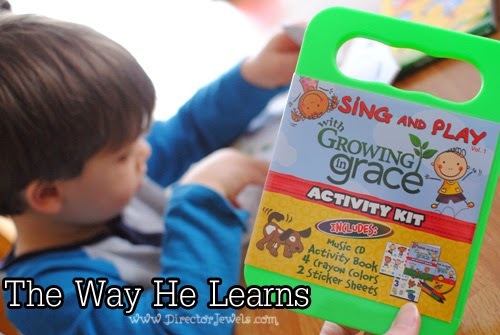 I was really happy with the Growing in Grace Sing and Play Activity Kit that Family Christian sent us to check out, because it fits right in with our style of learning in this season of Lincoln's life. The kit comes in a handy little carrying case and contains a CD of fun songs to sing (we listen in the car often), and an activity book, crayons, and sticker sheets. 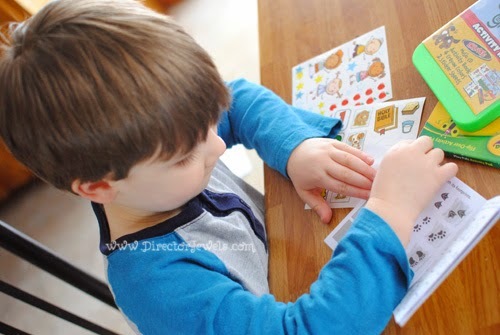 Lincoln's favorite part was the stickers - he was so excited to find the page of animal prints and match the correct sticker to each set of footprints. He did it all by himself, too! I was pretty proud. I love all of the music on this collection. It offers a wide range of tunes - from The William Tell Overture to God Made My Feet to No More Pie, the music genres represented are plentiful. The kids are both fairly obsessed with doing the Hokey Pokey. Make sure you follow Family Christian on Facebook, Twitter, Tumblr, Instagram, and Pinterest for all of their latest updates and new product releases! 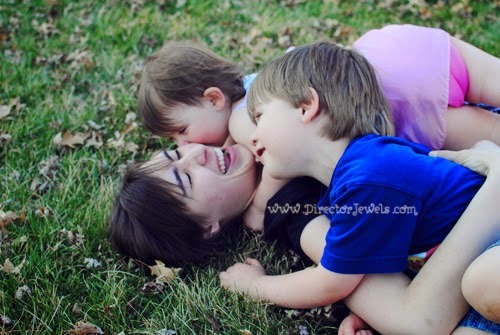 One Director Jewels reader will win a $10 Gift Certificate from Family Christian! This giveaway will end on April 3 at 11:59pm CST. This giveaway is open to US readers only. Winner will be emailed and will have 48 hours to respond or prize will be forfeited. 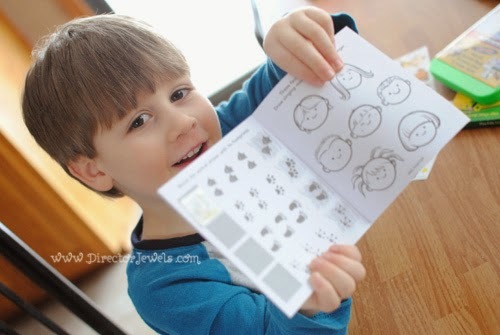 Disclosure: I received a sample activity kit to review. All opinions expressed are my own. For more information, you can read my Giveaway Policy and my Disclosure Policy. "Mommy! We made mud soup! Come see our mud soup!" He's way more excited about this than I am, but I stand up from my lawn chair on the deck and take his hand as he drags me down the stairs and to the pile of dirt, sticks, and wet grass that he and his sister have assembled. There is mud everywhere. Literally. Covering their faces, up their noses, and between the surface of each and every fingernail. They beam at me, so thrilled to be outside in the fresh air - away from the confines of our house and all its toys, which lost their appeal back in mid-January when the lack of sunshine threatened to drive all of us mad. "Do you want a taste, Mama? Mud soup is deeeeeee-licious!" The bright sun is good for my heart, too. On a bleak day in January, I might have sighed with impatience at the sight of food scattered on the floor or the pieces of twenty puzzles dumped in one heap or snow trampled all over the carpet. But today? It's okay. This sort of mess isn't so bad. It's a beautiful mess, and it's our mess...and I kind of secretly love it. Since the arrival of warmer weather, I've learned a couple of things. First, that my kids are going to literally live outside until it snows again. 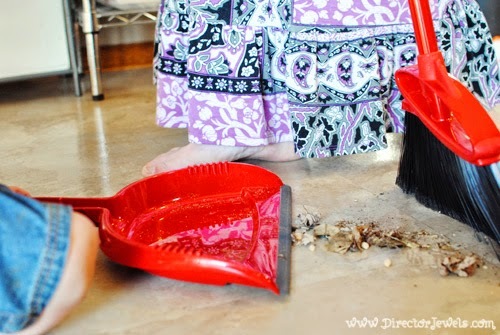 Second, that there is going to be a lot of dirt and grime covering just about every surface of my home. I've actually lost track of how many times I've swept the kitchen floor with my O-Cedar Angler Broom this week. And I pulled out the vacuum of my own free will last night. My whole family may or may not have looked at me like I was some sort of lunatic. Like, who is this woman and where did this strange noisy machine appear from? My helpers are eager today. They spend every waking moment asking "can I help?" or "what can I do, mommy?" This isn't going to last forever. 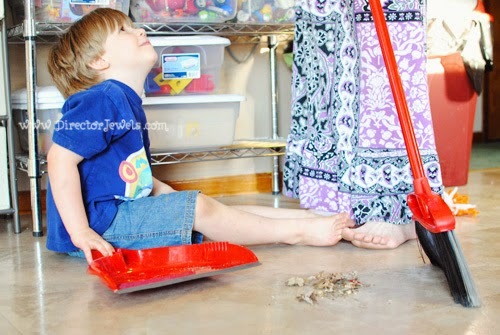 In a few years, I'm going to have teenagers on my hands - and at that point, they (probably) won't be responsible for tracking mud into the house thirteen times in one day. They'll remember to take their shoes off at the door (most of the time), they'll brush dust off their jeans, and they'll hopefully have a decent grasp at what it means to throw away their own trash. They'll be semi-responsible young people, on their way to adulthood. But at the same time, they'll be a little more interested in their friends than their mom who may or may not be wearing the same shirt as yesterday. 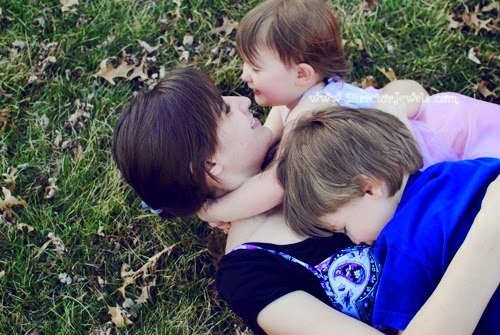 They'll ask me what I will do for them - not what they can do for me. I don't want to reach those years - not so far away - and look back at today with a longing that I had smiled instead of scowled, chased instead of chided, or tickled instead of turning on the television. I know it's inevitable to some degree. 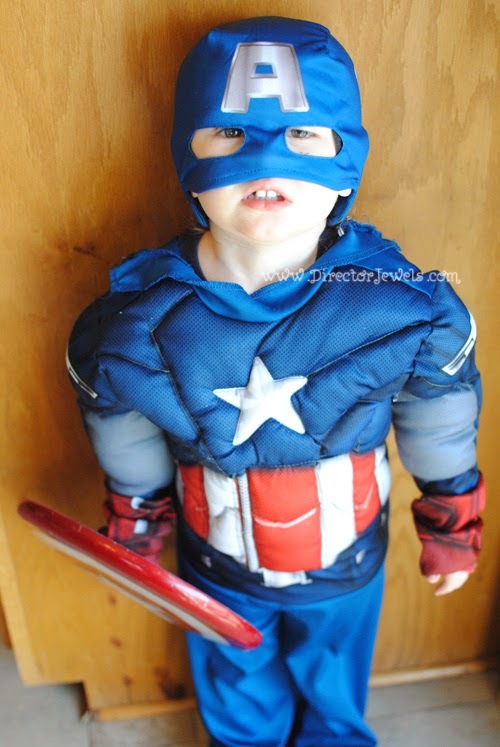 Kids grow up - regardless of how hard we mamas hang onto every little scrap of childhood that we can. But maybe...just maybe, if I let them help me now - every time - there's a greater likelihood that in ten years, they'll still want to spend time with me. And while making mud soup may be a little beyond their comfort level, I'll be down for a muddy water fight. I call dibs on the hose. 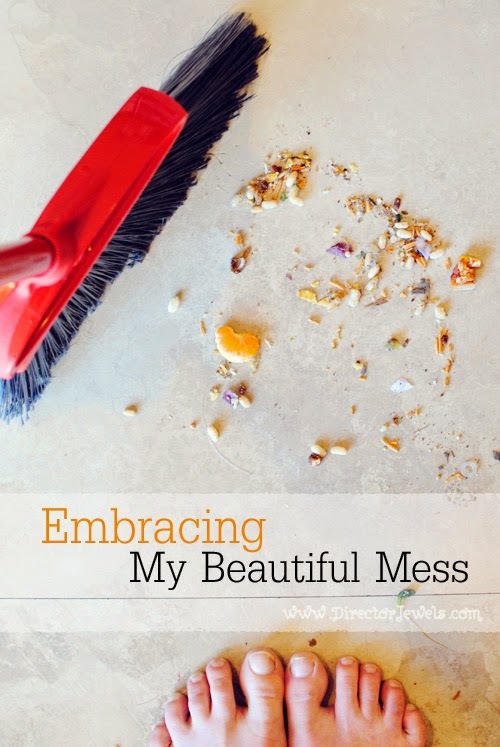 How are you celebrating the beautiful mess in your life? Disclosure: This shop has been compensated by Collective Bias, Inc. and its advertiser. All opinions are mine alone. For more information, you can read my Disclosure Policy. Lincoln - fussing about lack of snacks. Or the grass. Or the air. You know, all the important stuff. 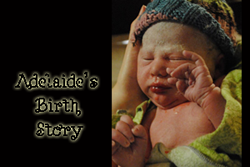 Addie - because Lincoln wearing it last week just wasn't cute enough? Just kidding. They're both adorable. Disclosure: I received a sample copy of this book to review. All opinions expressed are my own. 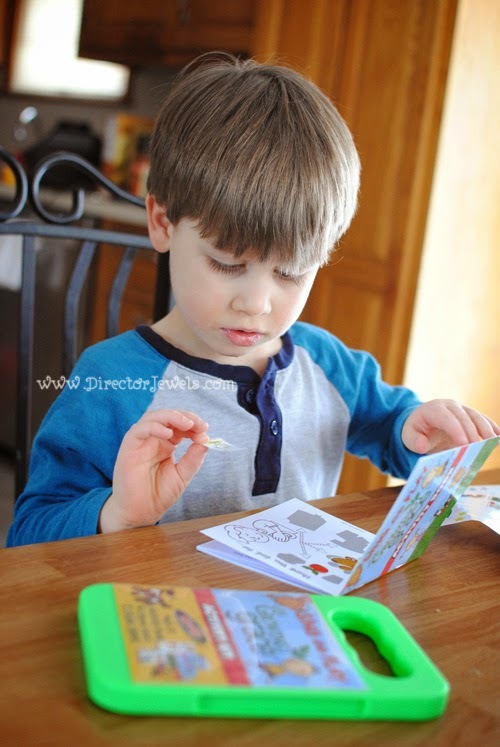 We love reading, and were so excited to receive Tiny Bear's Bible to review. This little book is a story Bible designed for kids who are 6 and under, which means it's just perfect for 4-year-old Lincoln and 2-year-old Addie. This Bible story collection, written by bestselling author Sally Lloyd-Jones, has been really popular with my kids. They love the fuzzy bear on the cover and I love that each page contains a reminder that God is watching out for us and cares about even the smallest worries in our lives. 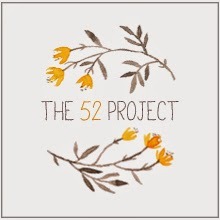 The book features stories of Creation, Noah, David, Daniel, Zacchaeus, and more. There are also pages retelling the truths of Jesus' birth, Jesus calming the storm, and the Lord's Prayer. 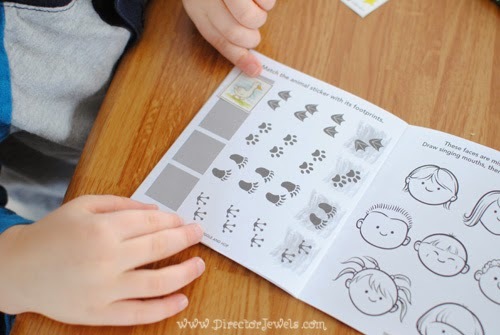 Each page contains only a paragraph or two, which is perfect for the attention span of my toddler and preschool readers. The illustrations by Igor Oleynikov are warm and comforting, and my kids love to point out the little bear on each page! The book is very durable and has survived being tossed around our house on more than one occasion. Teaching kids about the love of Jesus is not something that can happen with the reading of one book or the telling of one tale, so I'm grateful to have books like this in our collection to help us keep the Bible in our everyday consciousness. 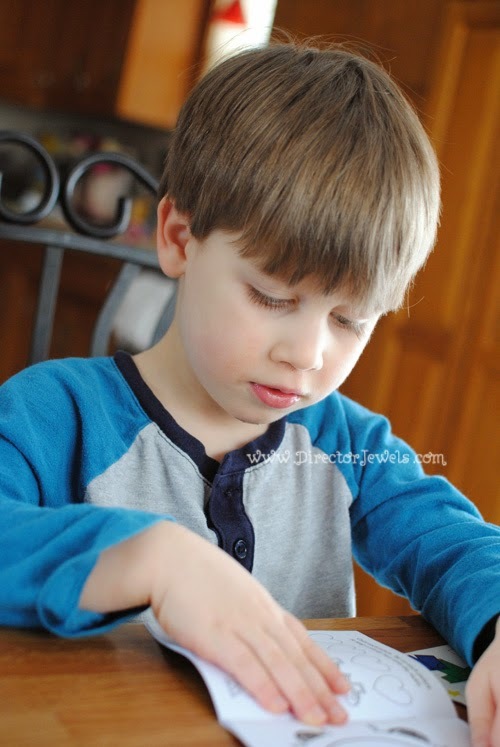 It can be hard to find consistency in teaching when you're keeping up with little ones and I'll be the first to admit that I fail at this often. I love having this book to help me show my kids how much God loves them - even when they are afraid, alone, or fearful! 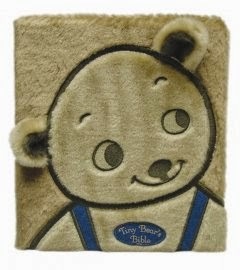 We're big fans of Tiny Bear's Bible and I think it will be a well-loved title in our family library. What's the favorite storybook in your house right now? 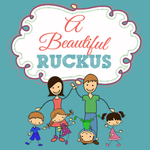 Thanks to BookLook Bloggers for my review sample of this book. I received no compensation for posting a review and all views expressed are my own. 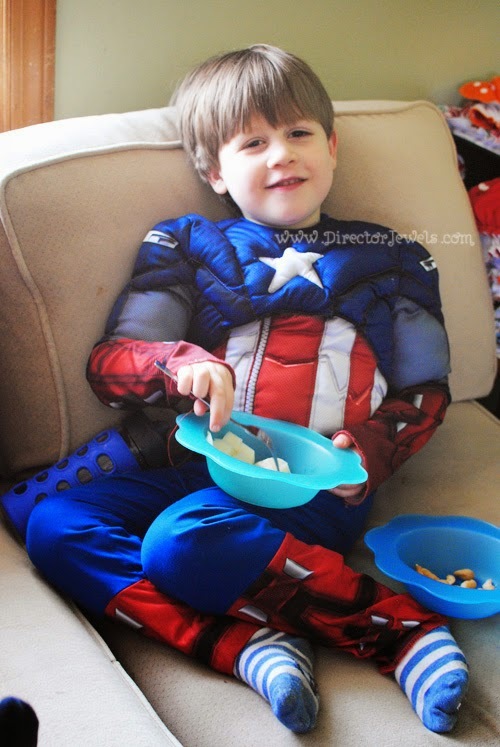 Lincoln - snack time for Captain America. The muscle suit kills me. 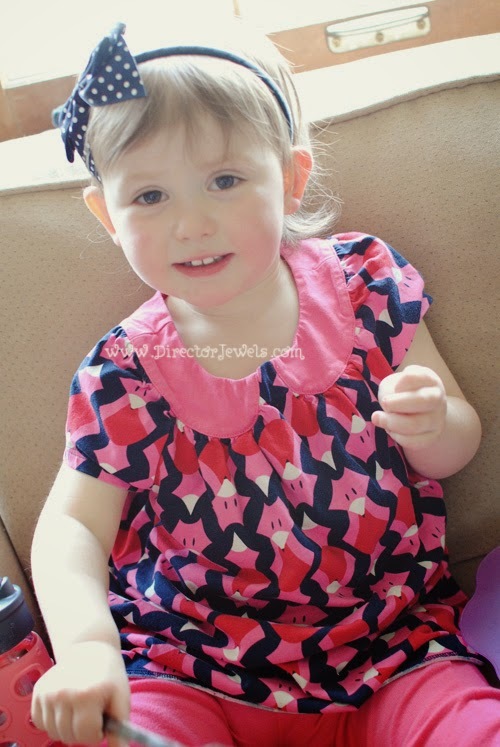 Addie - why does she look like she's six years old here? 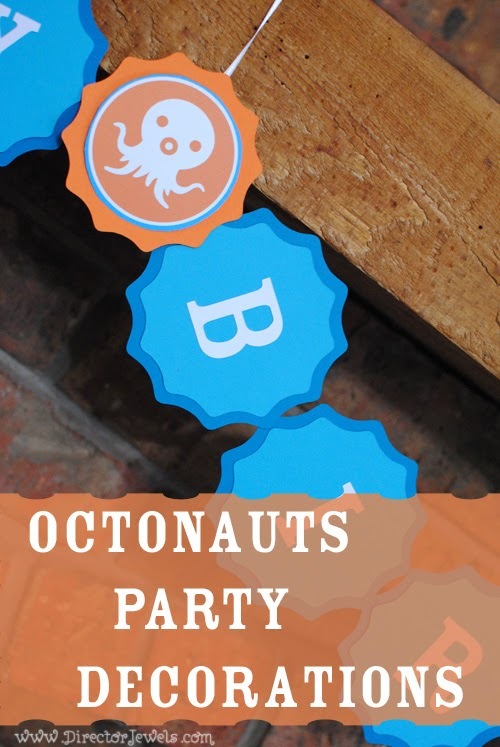 Looking for more Octonauts party ideas? 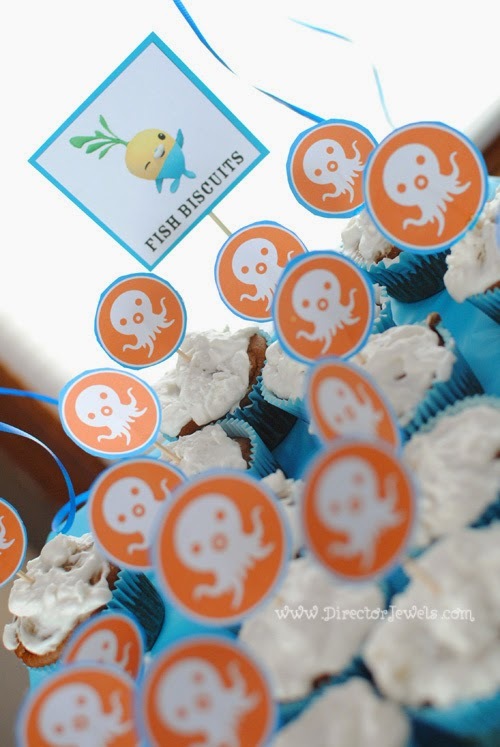 Make sure you check out Octonauts Favor Ideas, Octonauts Birthday Party Food Ideas, Octonauts Food Signs Free Printable, Sea Anemone Pipe Cleaner Craft and Paper Plate Fish Aquarium Craft! 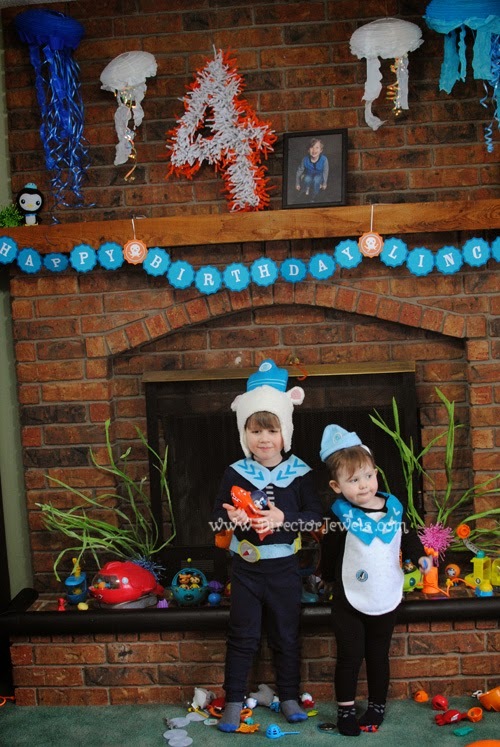 Lincoln talked about the Octonauts birthday party that he wanted for weeks and weeks before he turned four. 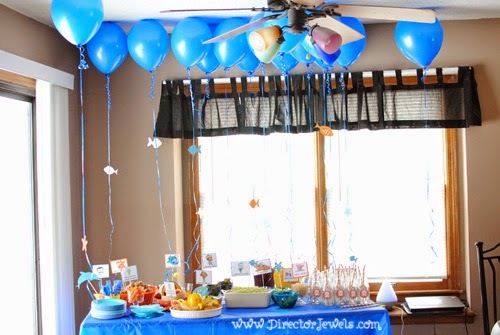 This was the first year that he had any interest in what I was planning, so I was extra motivated to make it awesome. 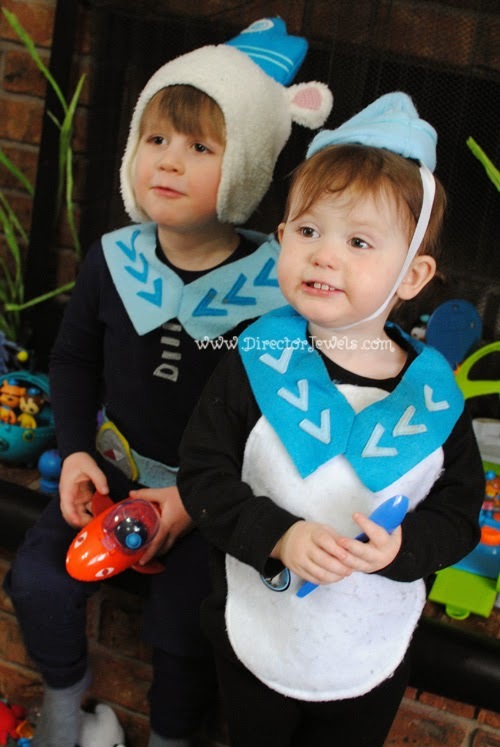 We already had Octonauts Costumes for Lincoln and Addie to wear, so that was perfect! 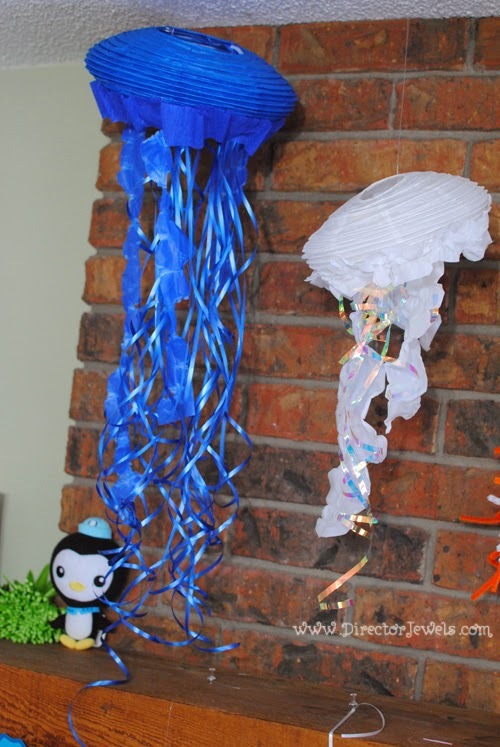 I went with a general "under the sea" decoration design, and added in Octonauts-specific themed items where possible. Since the show takes place in the ocean, I thought this was way easier than trying to create all completely Octonauts themed designs. 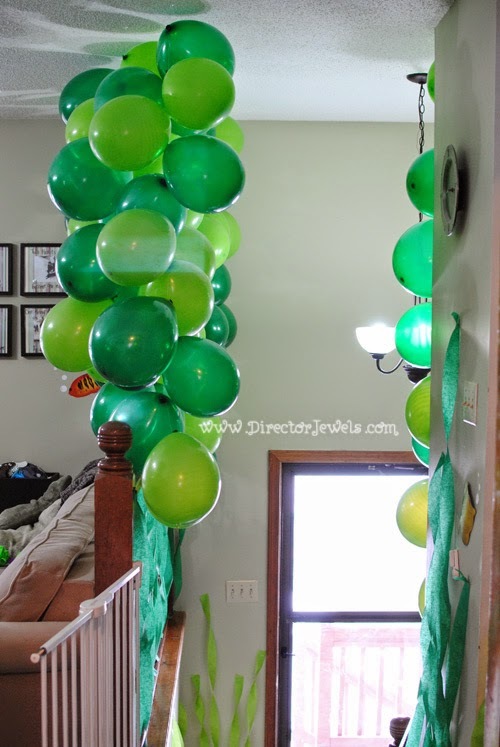 The first big project I tackled was making a Kelp Forest out of green balloons. 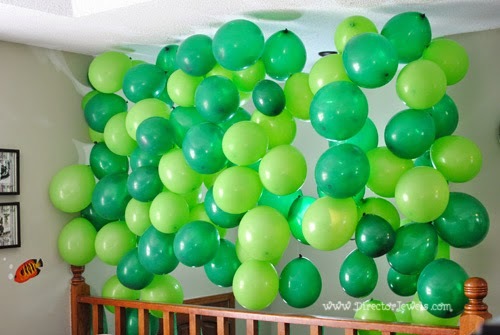 Andrew and I blew up about 140 forest and lime green balloons, then tied them in strands on fishing line and hung them from the ceiling using push pins. 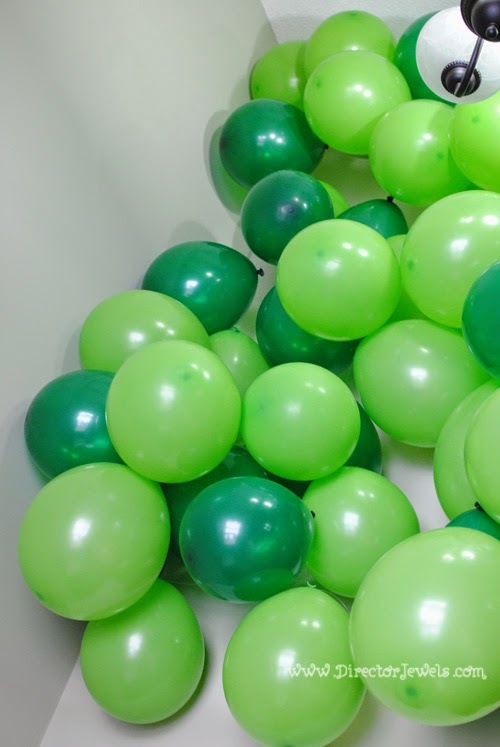 Since they were suspended in the air, whenever someone walked past, the balloons took on some ocean life properties and swayed gently back and forth. 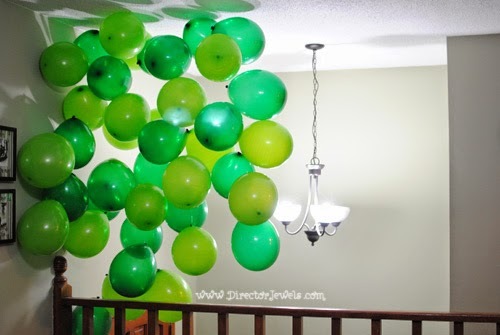 It was time consuming to blow up the balloons, but definitely a pretty effective decoration! Everyone thought it was cool. 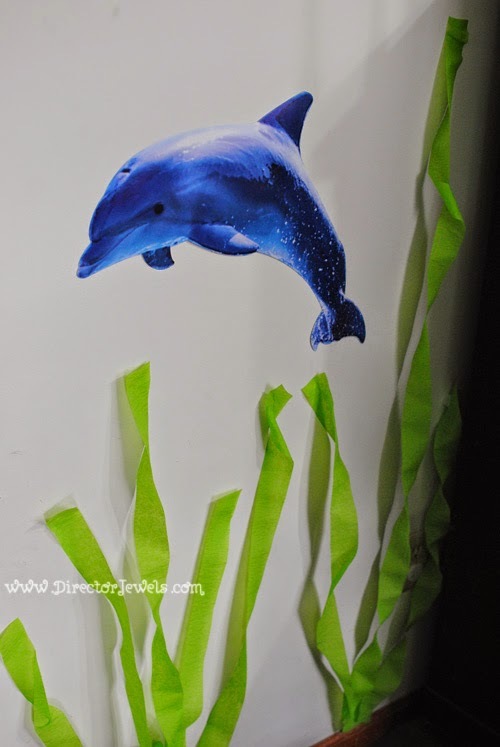 I also used crepe paper streamers to add seaweed strands throughout the entry (where the Kelp Forest hung). This is the view looking up when you entered the house. 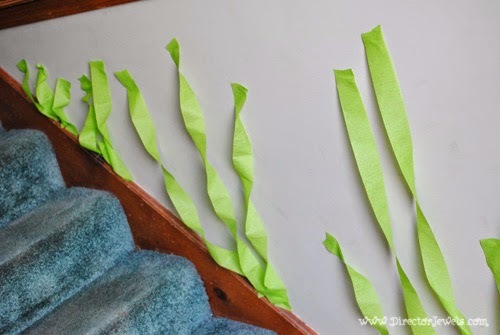 I continued the seaweed strands throughout the party, surrounding some Jumbo Sea Life Creatures from Oriental Trading that were attached to the wall. 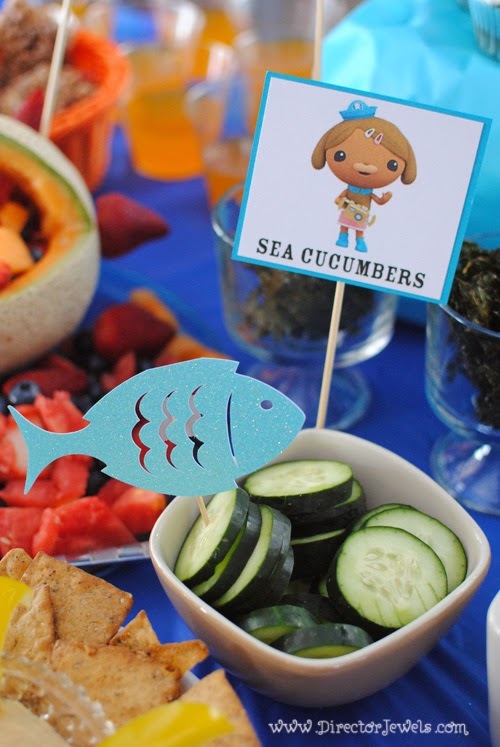 Even with many young kids in attendance, we didn't have any seaweed meet its doom during the party! 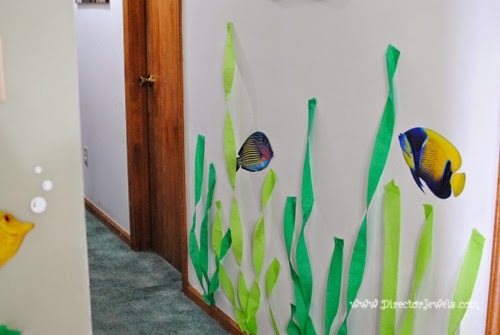 I used my Silhouette Portrait to cut out tons of bubbles for the fish and sea creatures on the walls. I didn't end up having time to place all of them, but the concept was cute anyway. 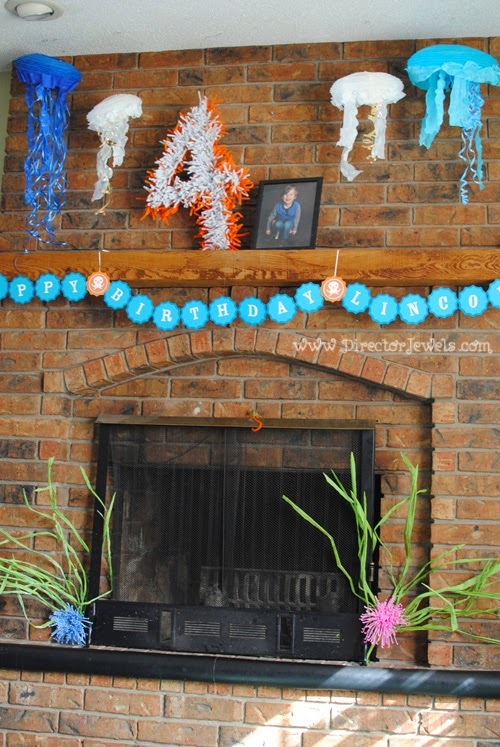 When I have a party, I love using my fireplace for a birthday banner and themed decor. 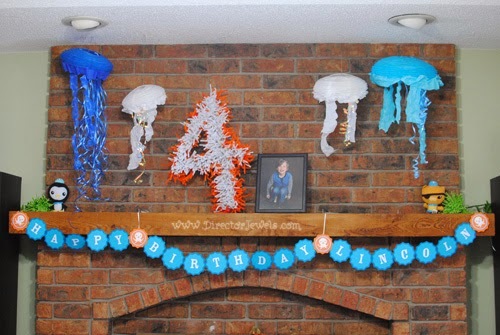 While I still love last year's Firetruck Party (because of the burning buildings), I also really loved how the DIY jellyfish, sea anemone "4", and simple banner turned out! I used my Silhouette for the banner shapes and letters. 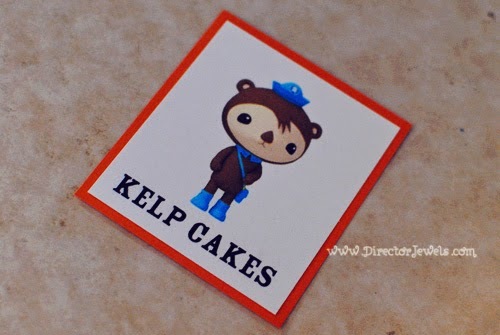 The font (similar to Octonauts style) is Rosewood Std Fill and was downloaded for free here. 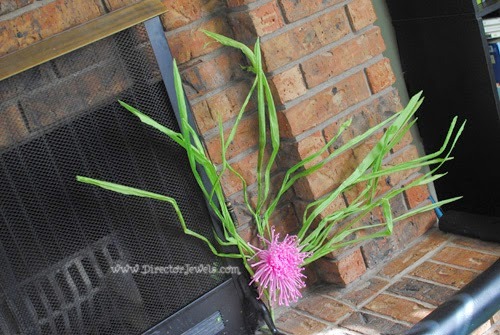 The seaweed decorations at the base of the fireplace were actually found at Hobby Lobby! They had some really neat floral picks that reminded me of sea life - and that was so much easier than trying to do more seaweed or sea urchin flowers myself. 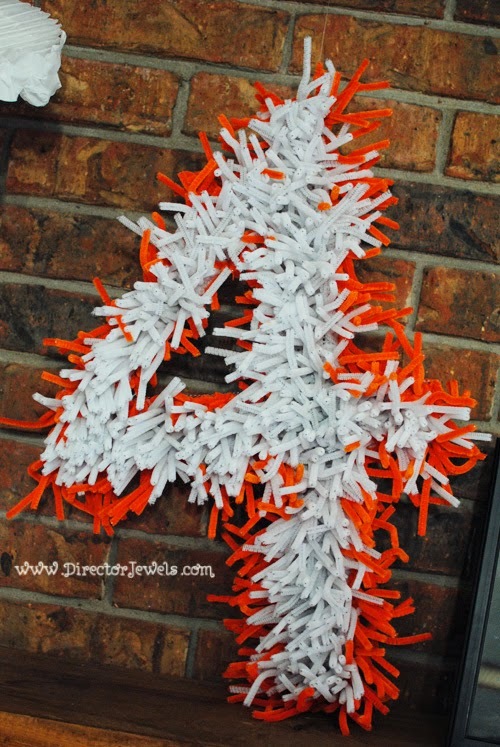 The sea anemone 4 was a random idea that popped into my mind in the middle of the night while I was crafting like crazy for the party, and I just love it! Watch for a tutorial next week sometime. I used our plush Octonaut pals to aid in the decor, too. 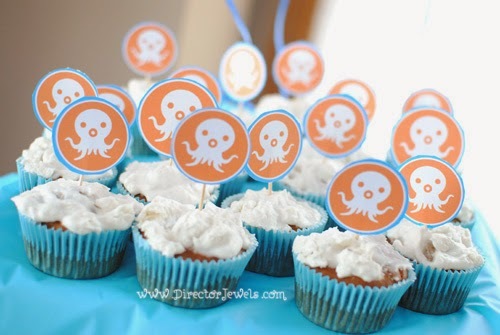 Overall, I was really pleased with how the decor looked - even without everything being overly Octonauts specific. I did throw in a few touches - like the logo on the banner. 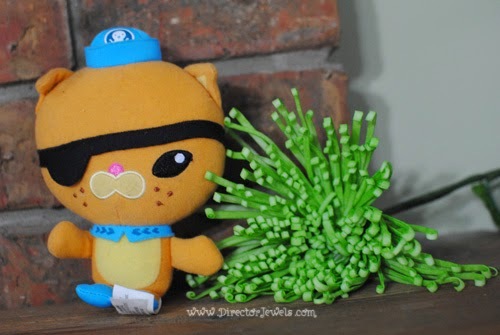 My little Captain Barnacles and Peso, enjoying the aftermath of the party and more Octonauts toys than I am proud to admit we own. The seaweed and urchin flower again, not surrounded by toys! 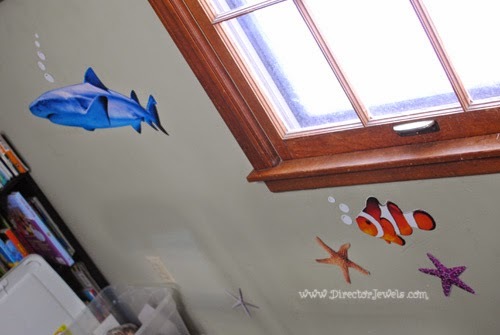 I don't have photos of all of the sea creatures, but they were scattered on the walls throughout the house. The last big decoration that I made (and almost forgot to hang up!) 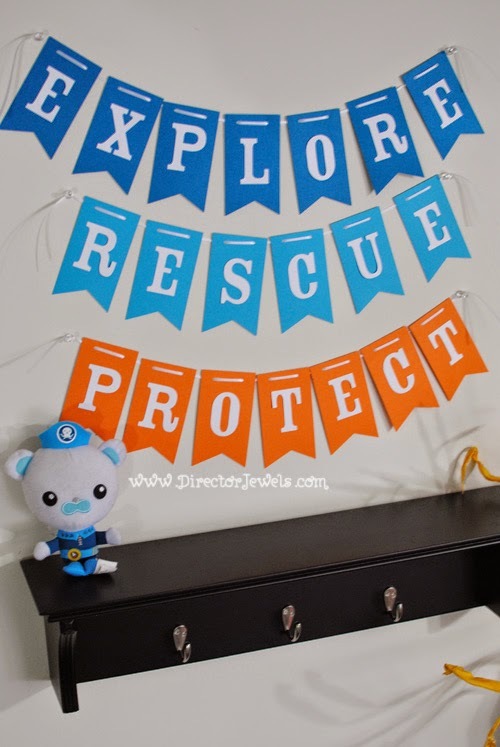 was the Explore, Rescue, Protect banner. This is the big theme phrase of the show and I made it in the three main show colors with my Silhouette. 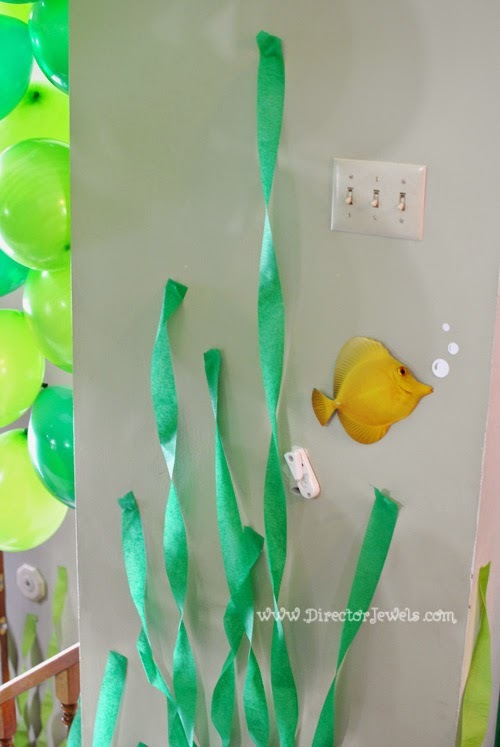 It was a simple touch that added a lot of pizzazz! 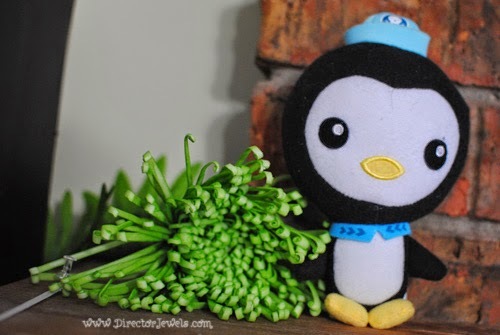 In the last photo, you can see a sneak peek of our Medic Bag Favors. They were so much fun to create that another post will be dedicated just to those, very soon! 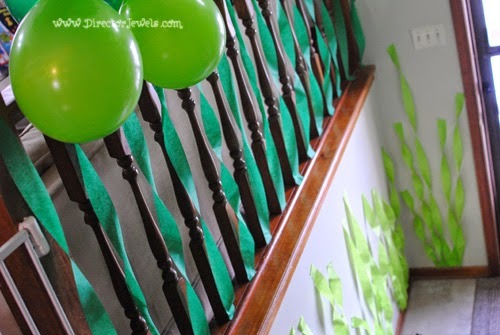 The party was two weeks ago and there are still several strands of Kelp Forest hanging up in my entryway. I'm taking it down one strand at a time so that I don't have mass hysteria on my hands when the kids notice it's disappeared!